Come one, come all to the Five Reel Circus where you will witness the amazements and wonders of the farther reaches of the world. Click here to play! Join in on this circus and you have a chance at winning plenty of cash! Watch the trainers tame the fearsome tiger. Spin two to five of this symbol across the reels and you'll win up to 7500 times your line bet. It also acts as a wild symbol and will replace all other symbols to help you create more wins! See the man shot out of a cannon. Spin two to five of this stunt man and you'll get up to 750 times your line bet. Also enjoy the antics of the ringmaster, clowns, seals elephants, lions and bears! That's not all! Be amazed by the bearded lady or the pretzel man! These two symbols will pay out up to 200 times your line bet! It's always a good time at the circus. 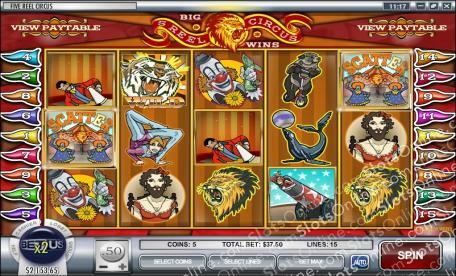 Spin the circus scatter symbol and you could multiply your total bet up to 100 times! Spin three or more and you will win 10 free spins in which prizes are tripled. Join in all the fun and amazement when the Five Reel Circus come to town and you could leave with fistfuls of cash! The circus symbol acts as a scatter. Not only will this symbol multiply your total bet if you spin two or more, but it will also award you with free spins if you spin three or more! Prizes are tripled during free spins. The roaring tiger acts as a wild symbol. It will replace all other symbols except scatters to help you create more winning combinations. Spin two or more on an active pay line and you could get up to 7500 times your line bet.